I love this time of year! There are several holidays on the horizon and I always get excited to host special guests that come to visit. It’s such a special time of year to have visitors and friends and family come together and enjoy time with one another. I like to make sure my guests feel welcome and comfortable in my home. That starts with breakfast! Who doesn’t love a good breakfast? 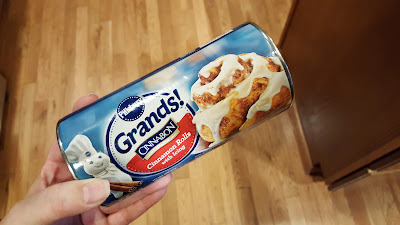 Pillsbury™ Grands! 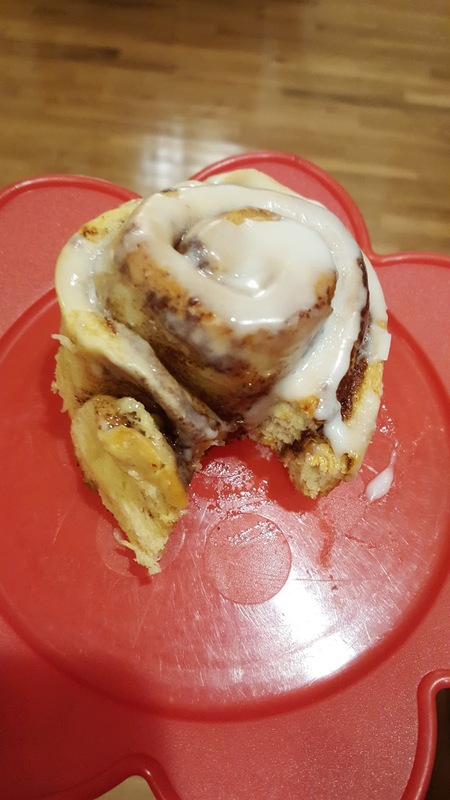 Cinnamon Rolls are the perfect breakfast for your guests during the holiday season. They are a perfect special indulgence for special guests. I love that they are easy, delicious and quick to prepare. No matter what time your guests awake, you can pop these in the oven and in no time they will have a special delicious breakfast that feels like you are pampering them. The smells that will fill your home make it feel like the holidays! 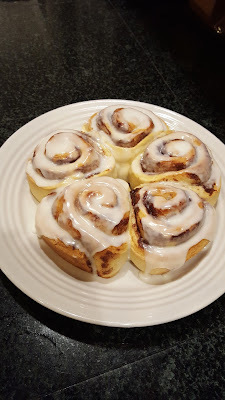 What I especially love about the Pillsbury™ Grands! Cinnamon Rolls is the fact that I can just pop them in the oven and continue to enjoy my special guests without being in the kitchen cooking and taking time away from them. The most important thing you can give your guests is time. Your house will also smell amazing while they bake! Laundry is such a chore at my house. I’ve got three boys at home, plus my husband so you can imagine how quickly the laundry piles up! It is summer too, so there are all sorts of things that need to be washed like sports gear, swimming and beach gear, towels and all our regular clothing too. With three boys you can imagine the tough stains I face, as well. Somehow they manage to get a stain with every park trip-grass stains or mud stains! And not to mention keeping the ketchup and mustard stains at bay during summer BBQ season. Well, OxiClean™ comes to my rescue! Did you know they make a laundry detergent now? Yes, they do. You’re welcome. OxiClean™ is an all-in-one solution that can be used on all of your laundry* to help remove stains, brighten your colors & whites and leave a long lasting freshness. It also helps save you time since it can help you get out tough, dried-on stains the first time. Packed with three color-safe OxiClean™ stain-fighters, it helps break down and remove a wide range of tough, dried-on stains the first time. Exactly what I need in my house! 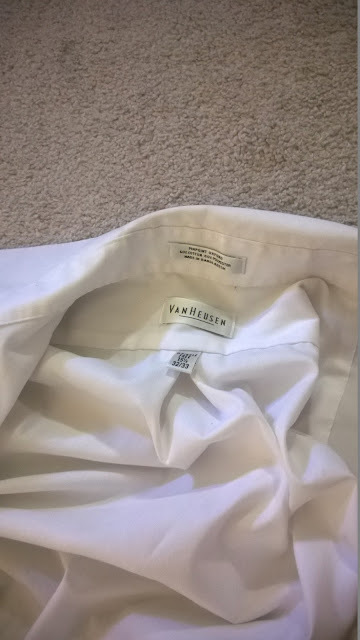 I’ve been washing this shirt of my husband’s that has stains along the collar and I just haven’t been able to get it back to the bright white color I want. You can see those dark stains around the collar. OxiClean™ Laundry Detergent totally got rid of the stains and made a brilliant white shirt! I was so happy because I was about to throw this shirt away and purchase a new one, and now I don’t have to! Wow factor, right?! 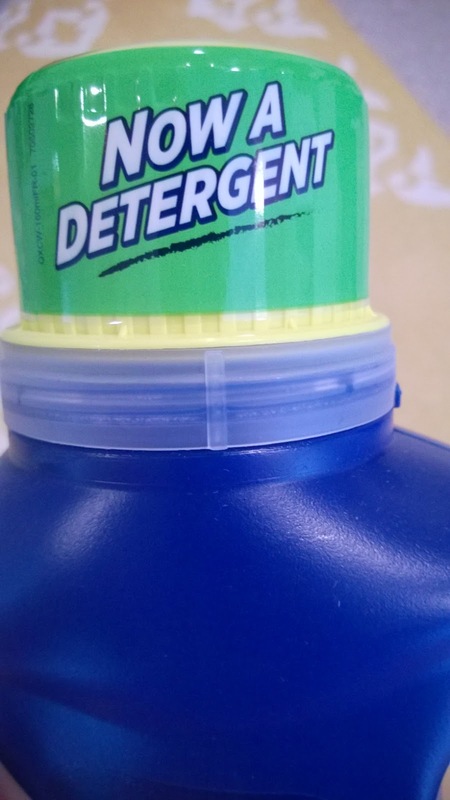 You should definitely try out the new OxiClean™ Laundry detergent and see if you can get some of your toughest stains out! *Please follow manufacturer directions for your garments. 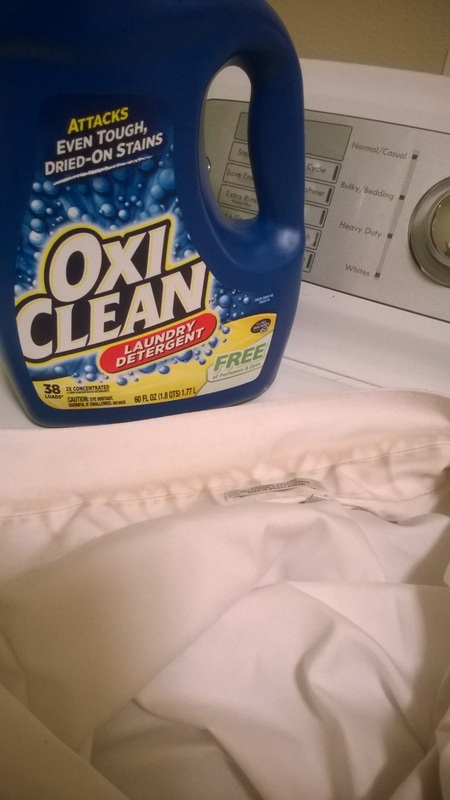 For best results, pretreat stains with laundry detergent, wait 5-10 minutes and then wash.
Disclosure: This post was sponsored by OxiClean™ through their partnership with POPSUGAR Select. 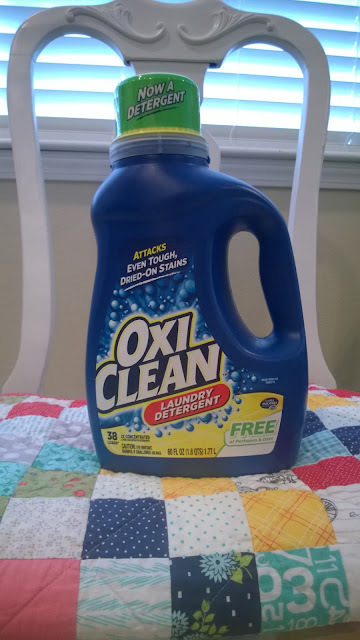 While I was compensated to write a post about OxiClean™ Laundry, all opinions are my own. Does anyone else get tired of packing lunches for your kids? It can get so monotonous! 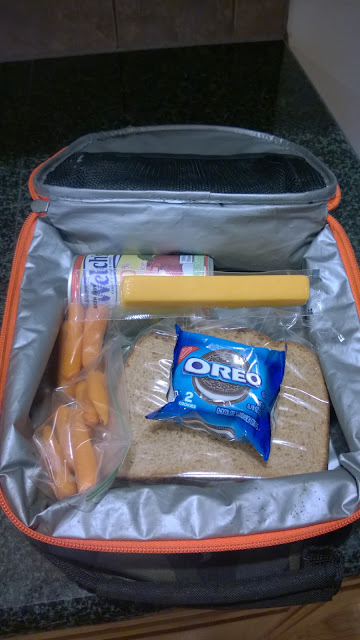 I never want my kids to get bored of what I pack for them, so I try really hard to mix up what I give them. I also want to be conscious of packing healthy items that will sustain them throughout the school day. It can be hard since the healthy items are often perishable and harder to pack until it is time to eat. 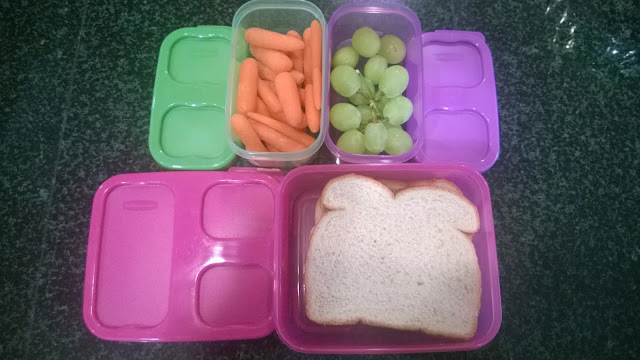 With Summer here, I wanted to make sure I took some time to get creative and new ideas for packing back to school lunches in Fall. 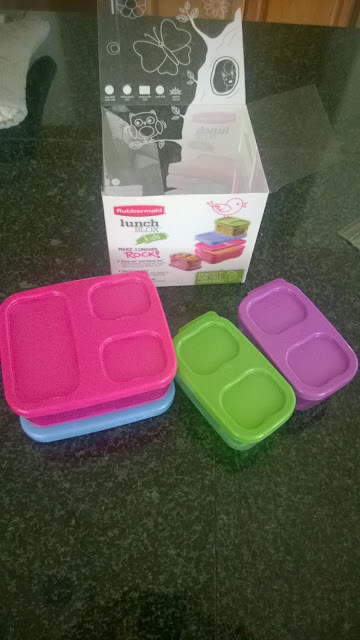 First I started with getting some new lunch boxes and containers! 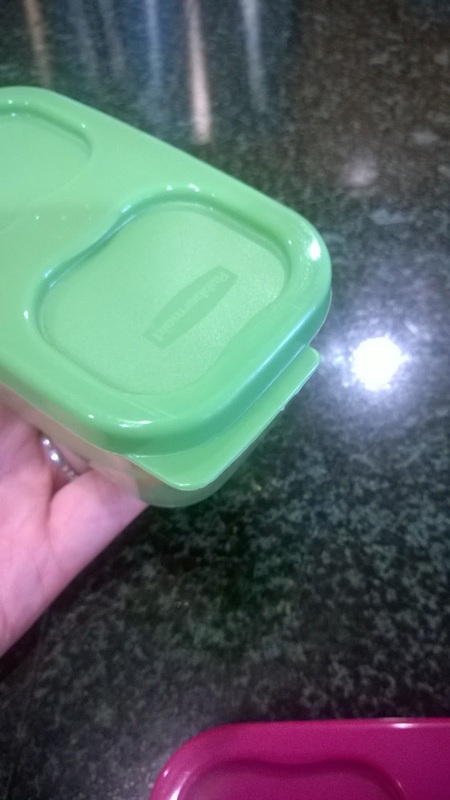 Have you seen the Rubbermaid LunchBlox? These are awesome! 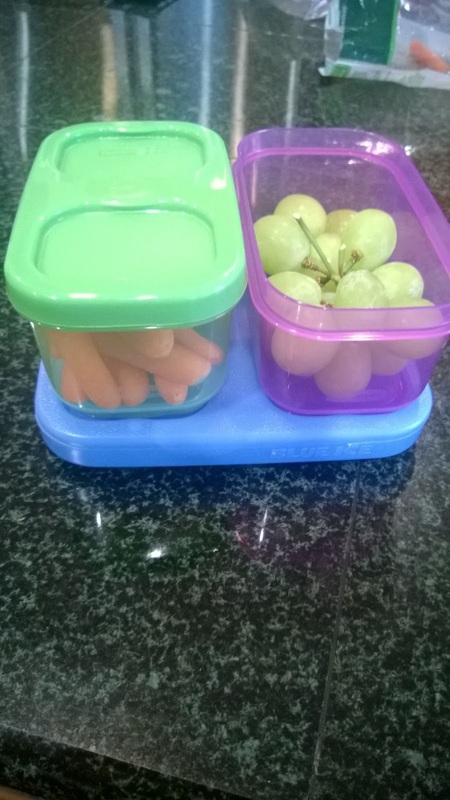 Just these containers alone are going to make for more exciting lunches for my kids, let alone the food I decide to pack in them. I love that I can send foods in them that I might be hesitant to send in a bag, like carrots with dip or salad with dressing on it. I even like putting yogurt in them! I feel like my lunch options just grew so much! These are perfect for kids because they are easy to open with a little tab on the side so they will have no trouble using them. Rubbermaid LunchBlox comes with a cooling piece so you can feel confident sending perishable items into school no matter what time your child has lunch! The best part about it is the containers stack right on top of it so they stay cool for a long time! I think that is genius. I hope you can get creative this summer with lunch ideas! Pick up a Rubbermaid LunchBlox to add endless possibilities to your lunches! Disclosure: This post was sponsored by Rubbermaid through their partnership with POPSUGAR. While I was compensated by POPSUGAR to write a post about LunchBlox, all opinions are my own. Life with three boys is busy! Can any other moms relate? 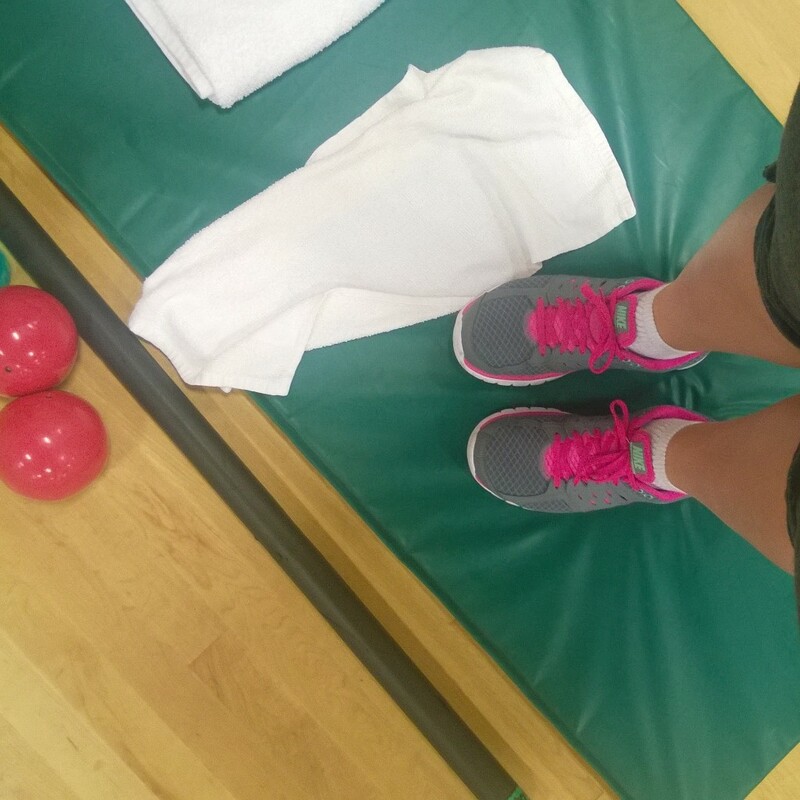 With Summer upon us, I feel a little bit of relief from the hectic school schedule, but life is still busy! We've got summer camps, summer lessons and plenty of beach days, trips and fun outings planned. We pack a lot of lunches in the summer and we love to hike and have picnic lunches wherever we are exploring. I always stock up on easy snacks to throw in a tote or backpack for days we are away. OREO has some new 2-packs that I am so happy about! These are a convenient grab-and-go snack designed for packed schedules. Plus, I love that they are portioned just right. 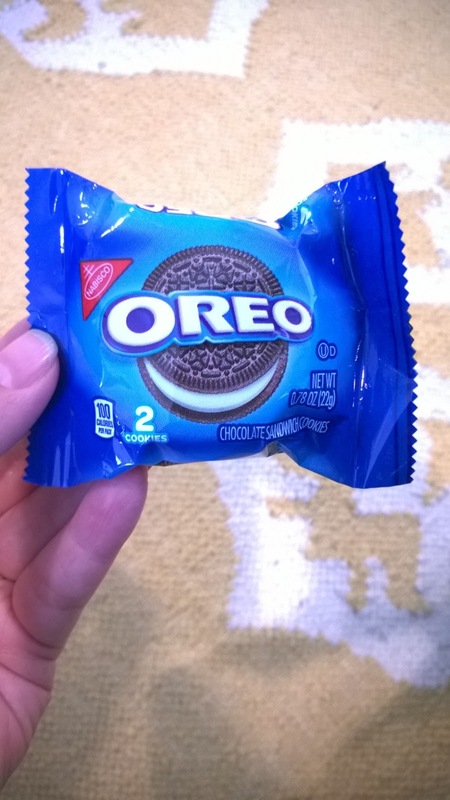 Containing two cookies per pack, this OREO 2-pack is the perfect serving size to satisfy your sweet tooth on-the-go. 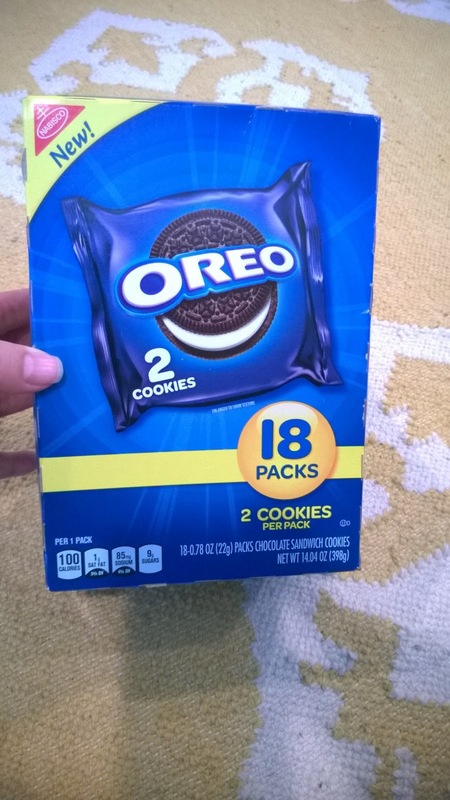 Whether it’s slipped into your purse or tucked away in the glove compartment, the OREO 2-pack is perfect for a quick treat at work, running errands, carpooling to family activities or family day trips. I have been putting them in my boys' lunches and they were so excited the first time they got one! They loved that it was the perfect treat size and had two full size cookies! I'll admit. These aren't just perfect for kids. I tossed one in my purse when I had a long, busy day and I was so happy to grab a little treat on the go when I was feeling hungry. I know you and your family with love these new OREO 2-packs just as much as I do. With all your summer plans you will want to have these on hand to take with you and enjoy! 2-pack multipacks are also available in Nutter Butter. Happy Summer! I love milk. I especially love milk with my chocolate cake, but that can't happen all the time so I try to get my milk in at other times. I also try to ensure my kids are getting milk and drinking up for their growing bodies! I like to start every day with the power of protein. Milk has 8 grams of high-quality protein, which could be the difference between just living life…and milking it! It also has 9 essential nutrients in each 8 ounce glass. So, in order to milk life, I decided to complete the Milk Life Challenge with my family! Their have been such fun challenges each day and it has made me realize that milking life is really so fun and inspiring. I want to make the most out of each day that I have with my precious family and enjoy all our moments together. One of the challenges we completed was the Be The Wheel Deal. It encouraged us to get out on some wheels...any wheels! 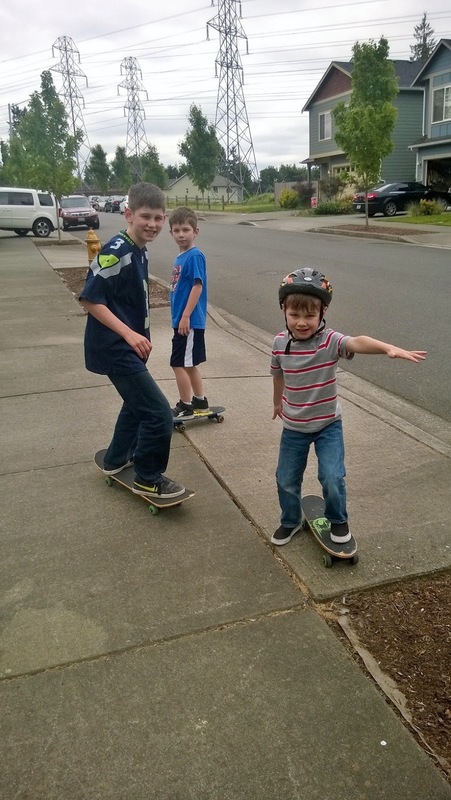 We got our skateboards and bikes out and had a blast. I personally did the Stretch Your Workout challenge by increasing my workout by 10 minutes. It made me realize that 10 minutes isn't that much! 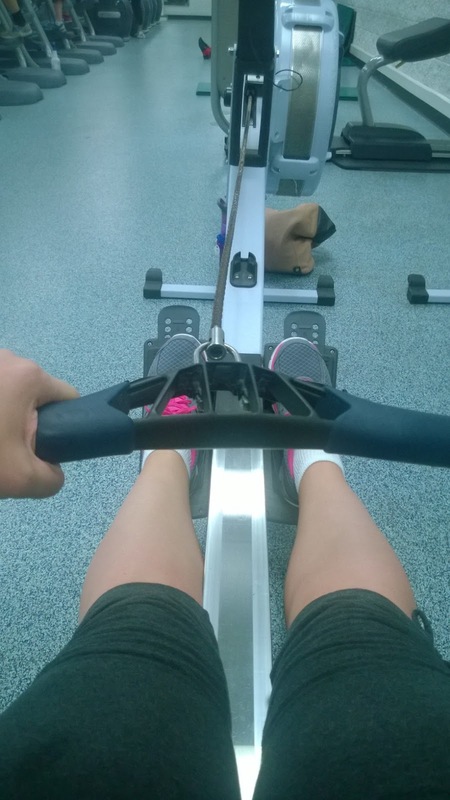 What a great way to challenge myself to do just a little bit more. You can convince yourself to do anything for 10 more minutes, yet it made me feel so much better those days because I had accomplished a challenge. Now that's milking life! So, how are you going to Milk Life? Be sure to check out the Milk Life Challenge and accomplish something new! You might even win a prize! Having a new baby is so exciting yet it can be so overwhelming at the same time! I’ve been celebrating with a friend who is about to have a baby soon and she was asking some of our friends about what things we wish we had known before we had our babies. We all swapped stories and shared with her in the joy and challenges a newborn will bring to her life. Getting advice from fellow moms is one of the best things for me when having my firstborn. There is so much to know and fellow moms can be such a great support to one another. One thing that one of my friends talked to me about before I had my firstborn was skincare. Babies have such sensitive skin and you want to make sure you are taking proper care of it! I was grateful for the wisdom she shared with me because after having my son I recognized immediately that he had very sensitive skin that was prone to irritation with many products I tried. 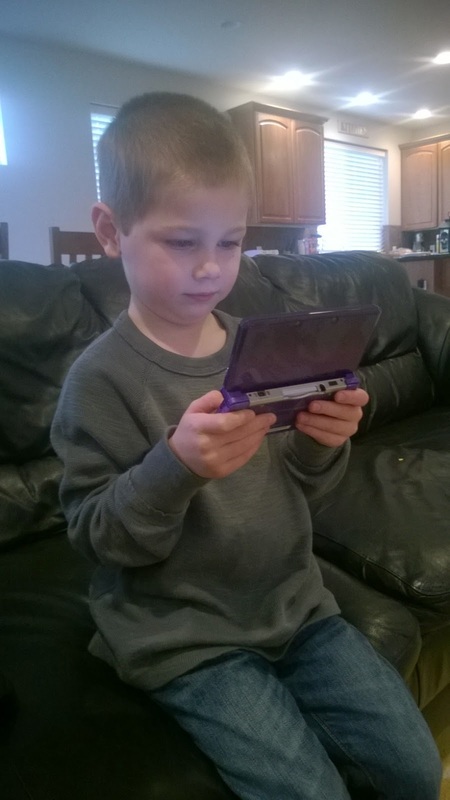 As he grew older we started seeing that he had eczema and we had to be careful about how we took care of his skin. There are so many gentle products out there that are made particularly for babies’ skin. A great line of products is Mustela. Mustela knows that nothing is more precious than your baby, and so it is committed to safety first and foremost. Developed in collaboration with healthcare professionals, all of Mustela’s products are hypoallergenic, high-tolerance and do not contain any parabens, phenoxyethanol, phtalates or alcohol. Before being marketed, they are systematically put through the strictest possible tests to confirm that they are of the safest quality. 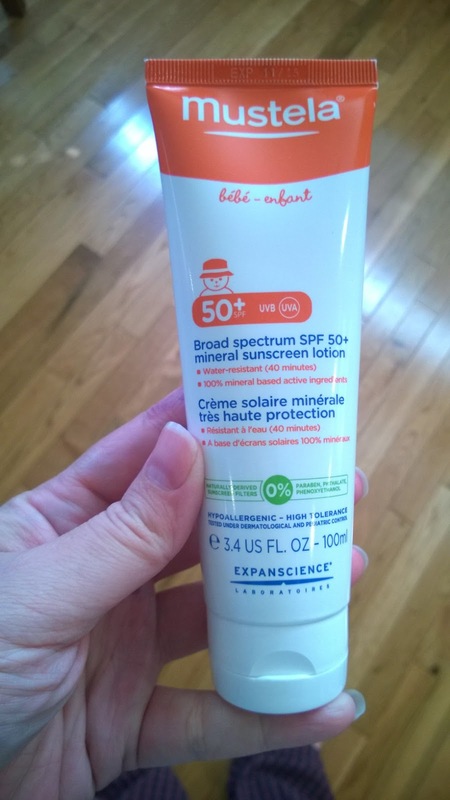 Sunscreen was a real irritant on my son’s skin but I knew that I needed to use it to protect his precious skin! 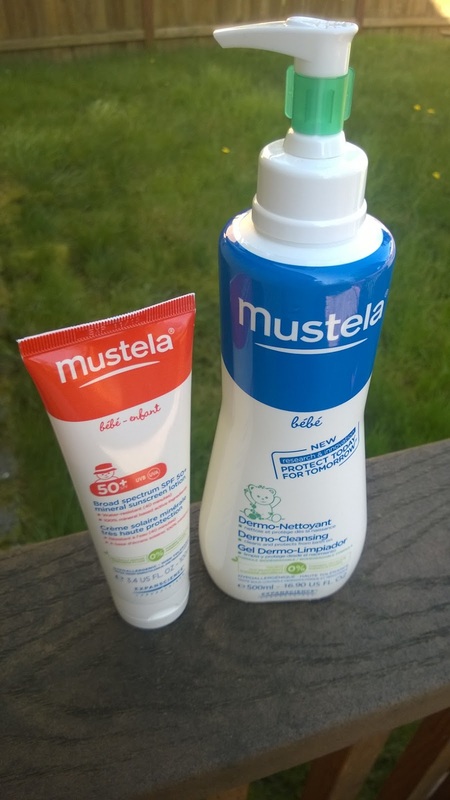 I am so glad to have the Mustela brand because it was just perfect for my son. Be sure to check out all of the Mustela products for purchase at Diapers.com and keep your little one’s skin healthy! Be sure to check out a cool contest Mustela has going on for Mother's Day! Head on over to their Facebook page to enter their Mustela Moms Know Best contest for a chance to win a bundle of products (over a $100 value!). There are two winners every day, so be sure to enter daily with your tips, tricks and advice! Anyone else get a little intimidated thinking about tax season? I know I sure have in the past, but using TurboTax has helped a ton! It can be a lot of work to get all your paperwork together and figure everything out especially if you have finances in a lot of different places. TurboTax really is simple and easy to navigate. The best part is you don't even have to leave your own home! You can feel really empowered to take charge of your own finances. TurboTax believes you are your own best advocate, and that you shouldn't have to be an expert to do your own taxes. That's why TurboTax is better than ever -- so you can easily prepare your own taxes with confidence. This means you'll get a simpler experience, custom-fit to your life and your taxes. And, if you ever need help, experts are there to back you up. 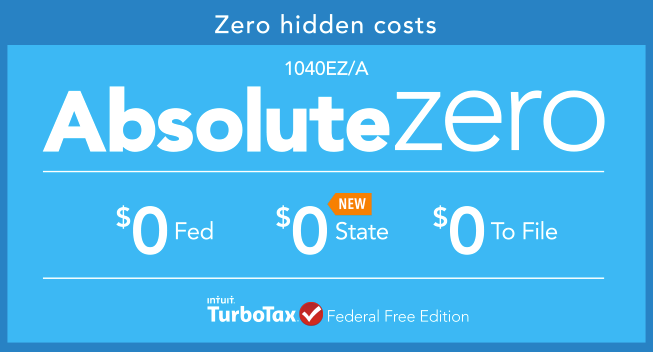 TurboTax has an amazing Absolute Zero promotion. •For the first time ever, Americans can file both their federal 1040A or 1040EZ returns, as well as their state returns, for absolutely $0 with TurboTax Federal Free Edition. •TurboTax is offering the 60 million hard-working Americans who file a simple tax return, a much-needed break. •That’s why TurboTax will provide TurboTax Federal Free Edition absolutely FREE. You pay zero. $0 fed. $0 state. $0 to file. This is such a great opportunity to take advantage of and get your taxes done! Feel empowered to do it yourself since you know your finances best, and feel great about staying in your own home to do it! Anybody else as crazy as I am and already starting some holiday gift shopping? I like to get a head start so that I don't feel stressed and agitated near the holidays when I want to relax and soak up the festivities. I have a great gift idea for the gamers in your life. 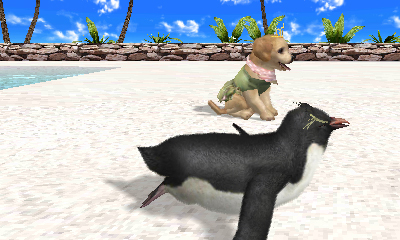 We recently got to try out the new Petz Beach game for Nintendo 3DS! This is a really fun game for all kids! The franchise that has sold over 23 million units worldwide is back and more interactive than ever. 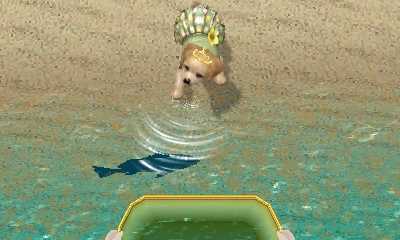 Petz fans will embark on the ultimate adventure in Petz Beach, where players can care for a variety of dogs, complete quests to expand their village and connect with other Petz owners. 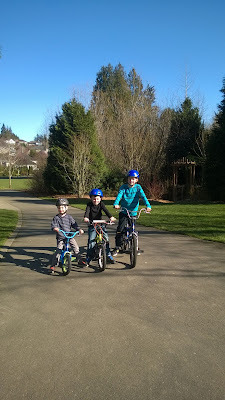 My boys loved the freedom they had in the game to explore so many different things! I love that creativity aspect of the game. There are more than 50 different types of animals in the game from dogs and cats, to dolphins and whales. Because the environment in game changes with the seasons, the adventure lasts all year long! As players explore the town and meet new neighbors with their pets, the game expands and grows. Helping new friends will expand the village as the game progresses. Through its partnership with Encyclopaedia Britannica, Petz Beach incorporates learning along the way. As kids care for their pets and complete missions, they’ll learn facts about animals, plants and insects! I loved seeing my boys have fun with this game! 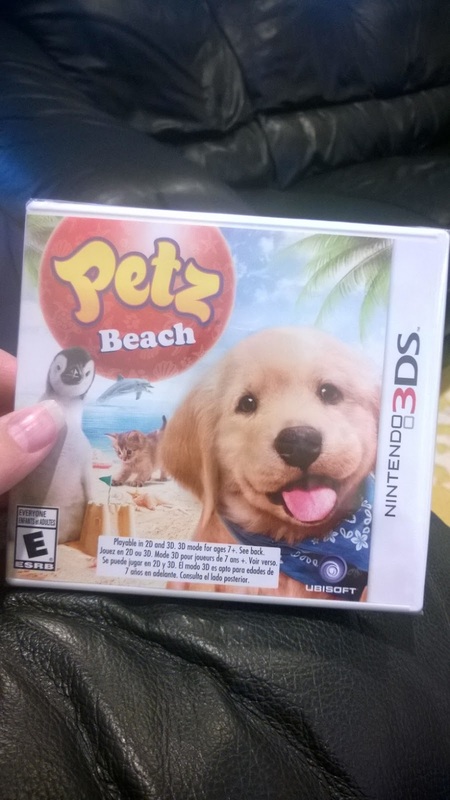 You can purchase the Petz Beach game on Amazon and get it in time for the holidays. It will make the perfect gift. Also be sure to check out the Petz Countryside game that has the same fun experience in a different environment! Last month I spent a fabulous weekend in Arizona with my high school girlfriends--a trip we plan in a different city every couple of years. Each trip is jam-packed with non-stop talking, eating, shopping, more talking, and very little sleep. And it's always over too soon. But this year we found time to add one more thing. . .crafting! What took us so long? Maybe the thought of coming up with a craft, buying all the supplies, and and figuring out how much everybody owed me was just too daunting. But then a fabulous new company called Apostrophe S came along and made it so EASY. I picked a craft, ordered the kits, and shoved them in my suitcase. Done! I was hooked as soon as I saw the cute packaging that all their crafts arrive in. . . I pulled out the kits late one night while we were sitting around in our jammies chatting. Our late night crafting party was probably the first time during the weekend that there was a pause in the conversation! 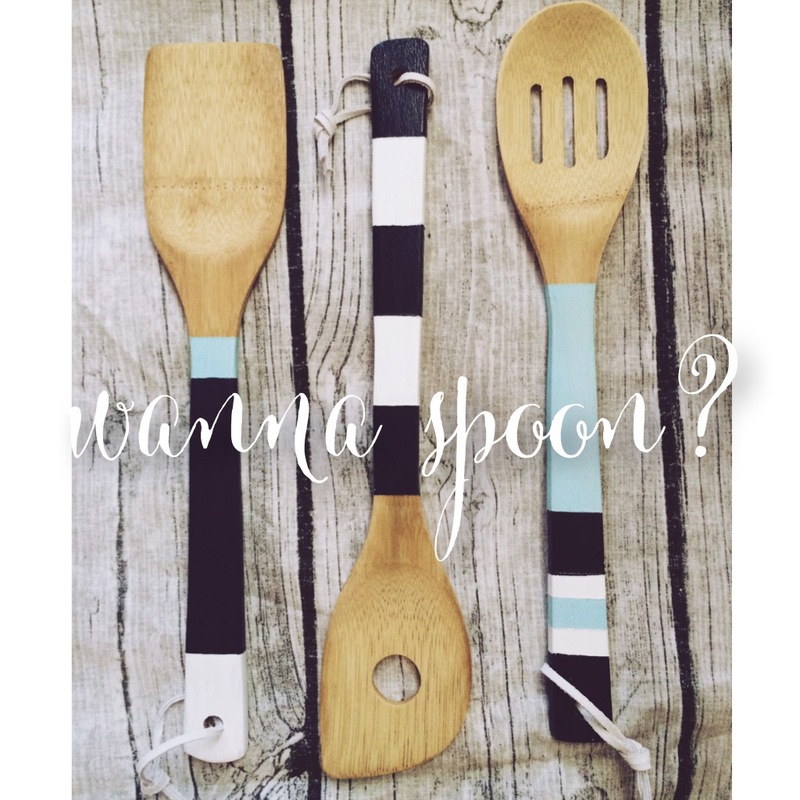 I chose this darling painted spoon craft for my friends and me to make. The "Wanna Spoon?" 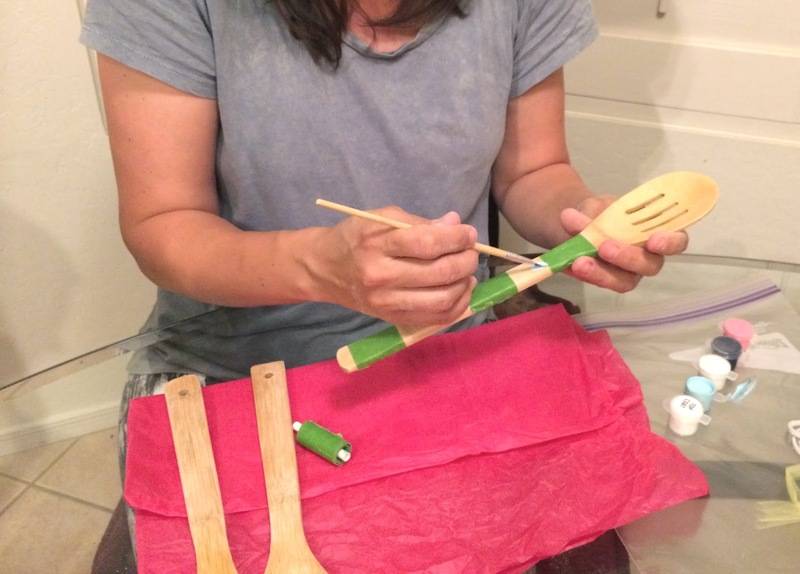 craft kit from Apostrophe S comes with three bamboo kitchen utensils, four paint colors, a clear top coat, painter's tape, sandpaper, a paintbrush, and leather ties for the spoons. All we really needed was scissors and a cup of water to rinse our brushes. 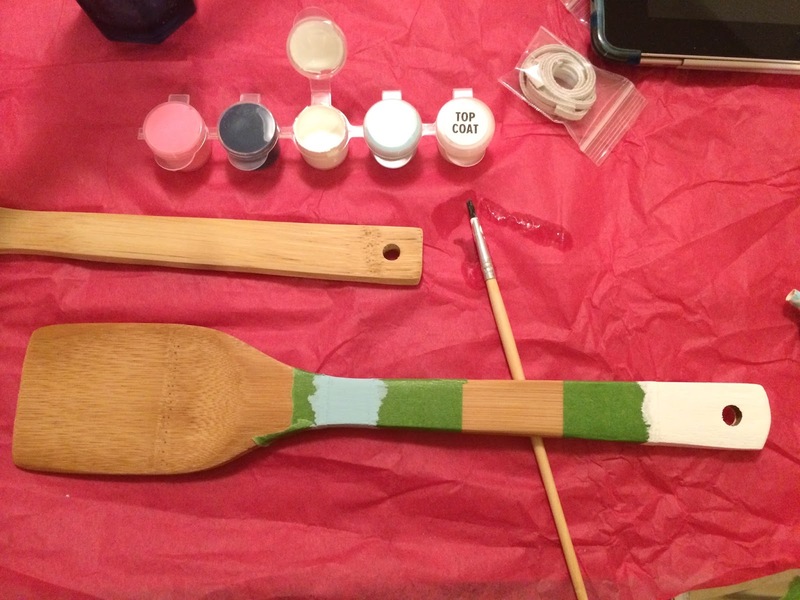 The project was simple to figure out, but in case we needed direction Apostrophe S has a video on their Web site showing how to make this painted spoon project start to finish. We pulled it up on our phones and watched it quickly before we started. 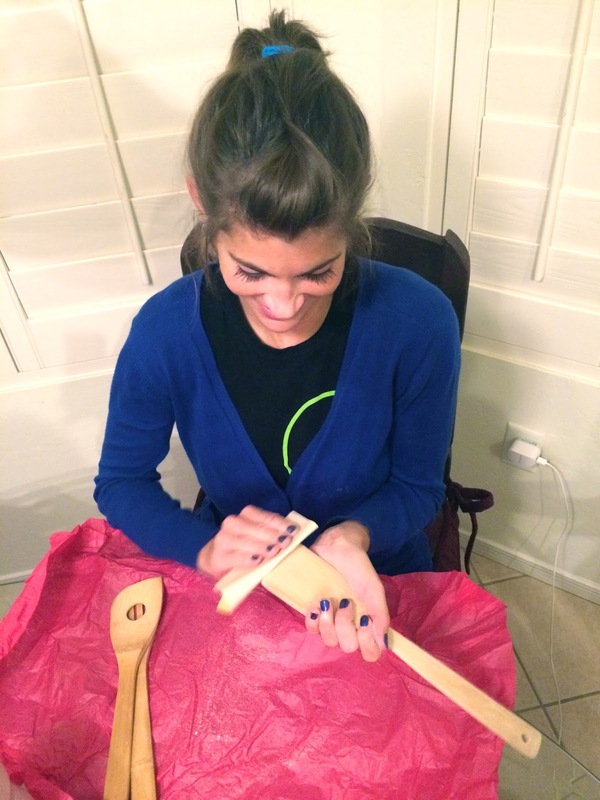 First we sanded the utensils. . .
Then we taped. 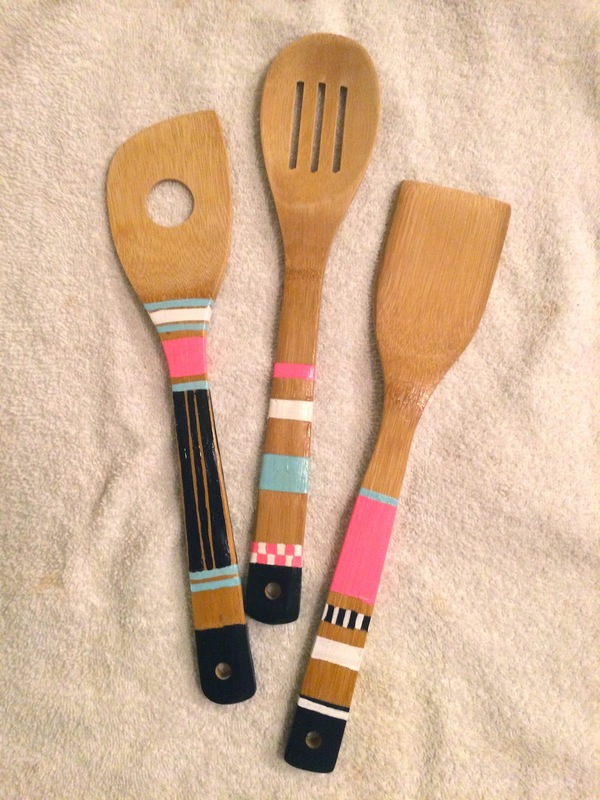 . .
Everyone's spoons turned out different but so cute! Most of us did simple color blocking. One friend was feeling more creative and added hand-painted details. I LOVE how her spoons turned out! 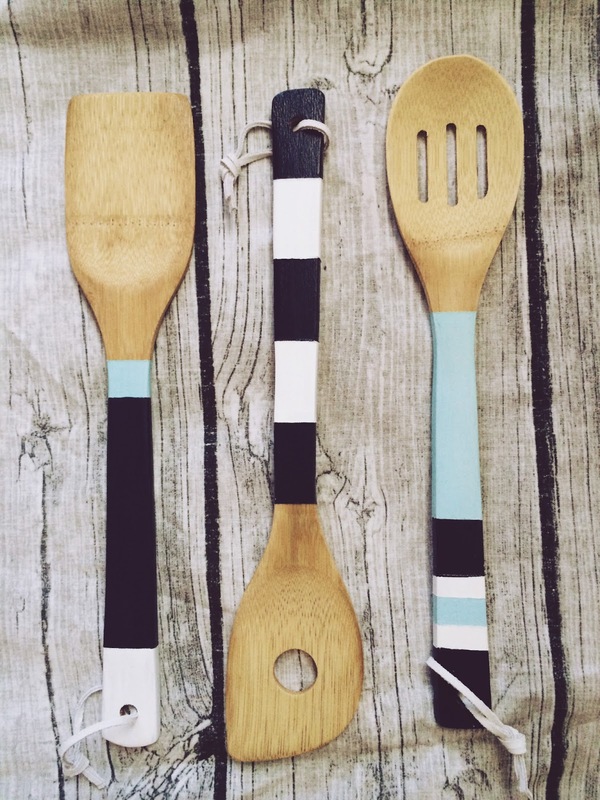 These are my spoons--a little simpler but I love them. These would make an awesome bridal shower gift (if I could bear to part with them!). 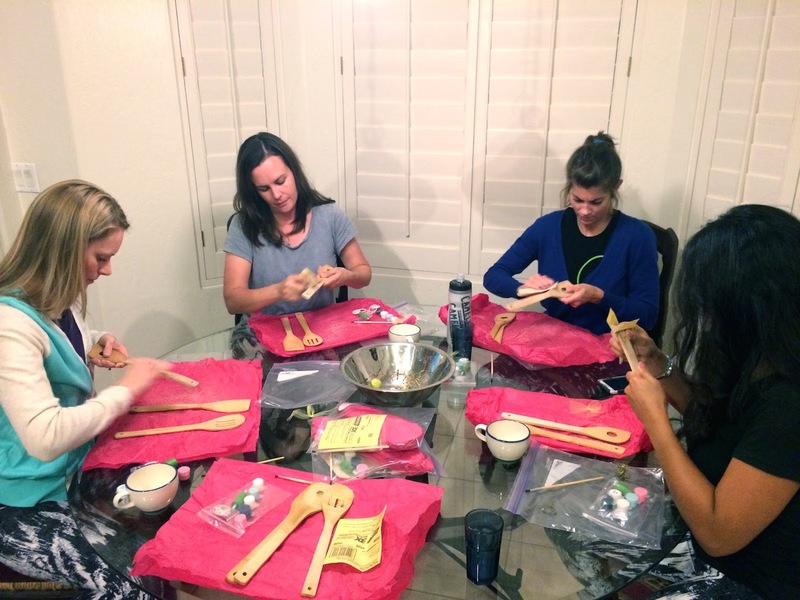 The cool things about Apostrophe S is that their craft kits are all-inclusive so you can host craft parties for friends without having to gather a bunch of supplies and hope everyone pays you back. And you don't have to all do the same project. 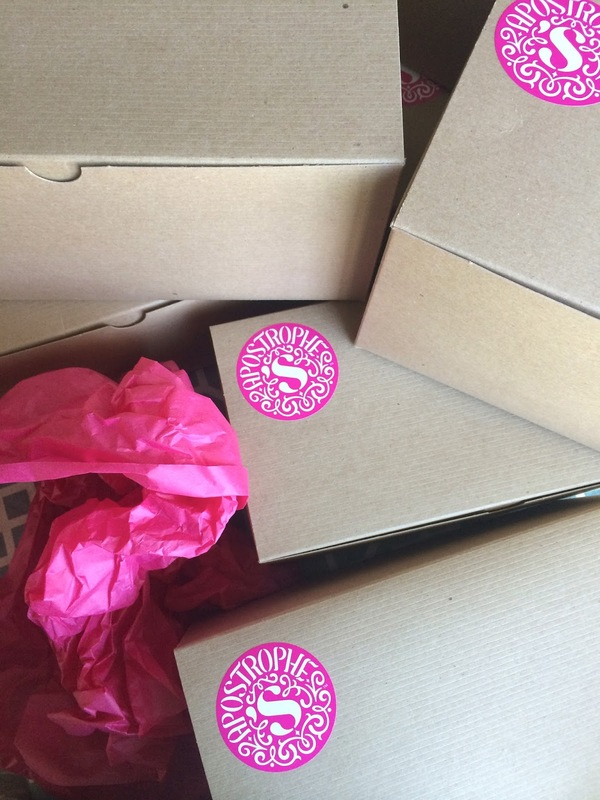 Each party guest goes to the Web site and pays for their kit, then all the kits are shipped to the hostess' house. The best part for me is that I can sit down with friends and make something cute that I will actually use and finish it in one night! Perfect because I am the Queen of Unfinished Projects. I've had the opportunity to attend two Apostrophe S craft parties so far. I made this darling Halloween wreath. 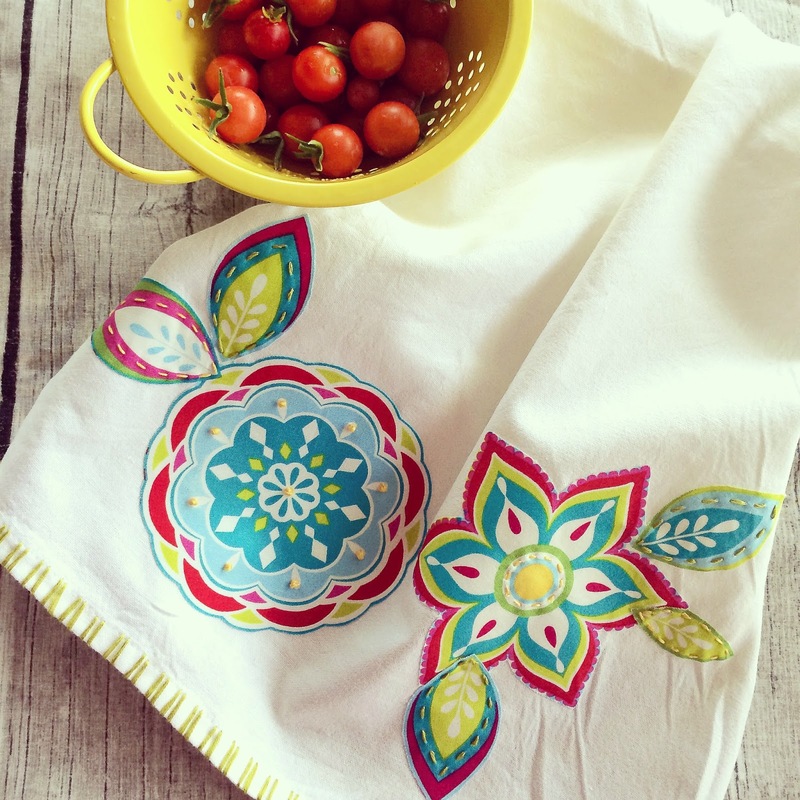 . .
And a couple of these Anthropologie-inspired tea towels. Next on my list is this gorgeous dream catcher that I think would be perfect in my niece's nursery. I am smitten with this new company. 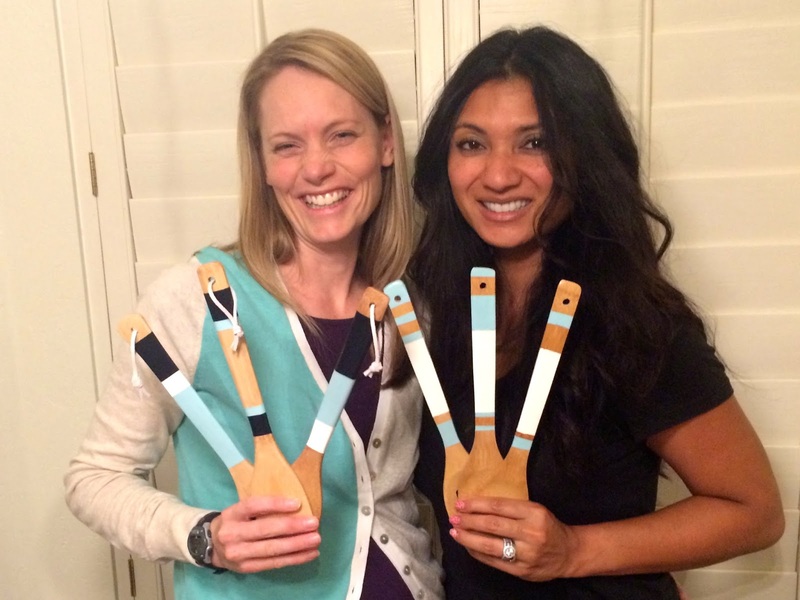 Check out Apostrophe-S.com to see all the craft kits in their store and to find out more about hosting a craft party. I promise there will be something there you will just have to make. You can also apply to be an Apostrophe S coordinator and get paid to help crafters set up their own parties (don't worry, it's a low-commitment gig with no annoying upselling or catalogs to hand out). Post your finished projects on Instagram and tag me so I can see what you make! 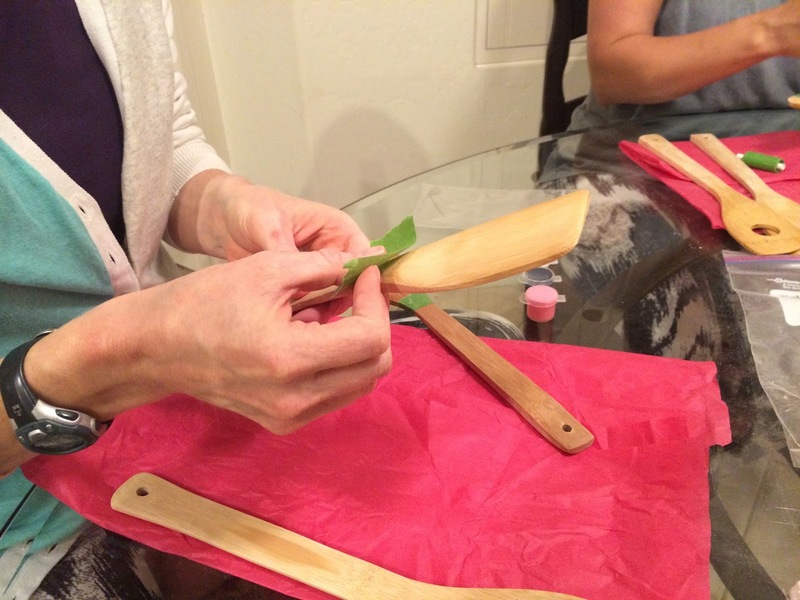 *I was supplied crafting kits by Apostrophe S for this post, but the opinions are all my own.